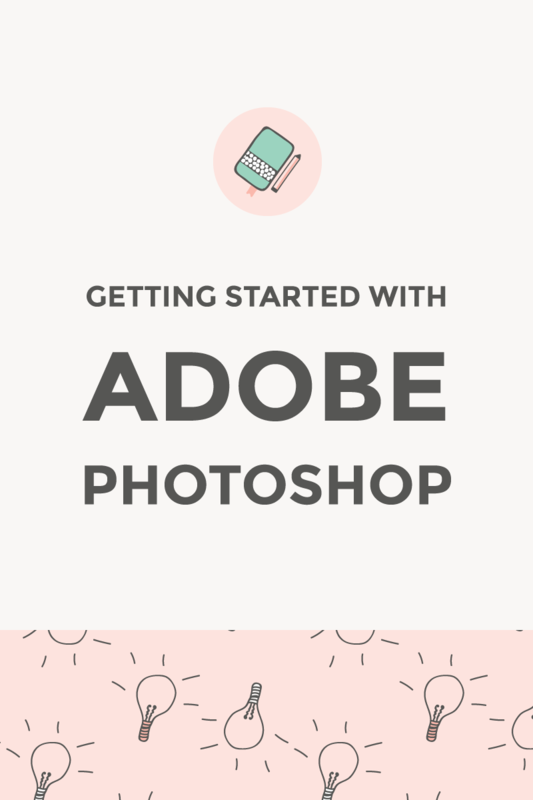 Getting Started with Adobe Photoshop ~ Elan Creative Co. 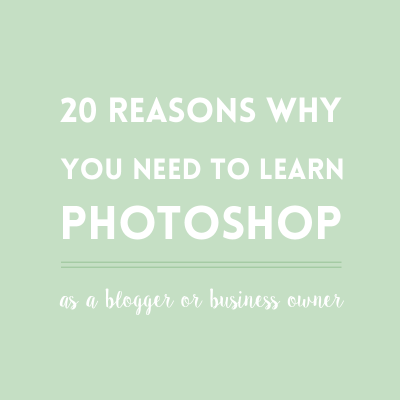 If you’ve visited my blog at least once before, you probably know that Photoshop is my favorite tool for blogging and design. 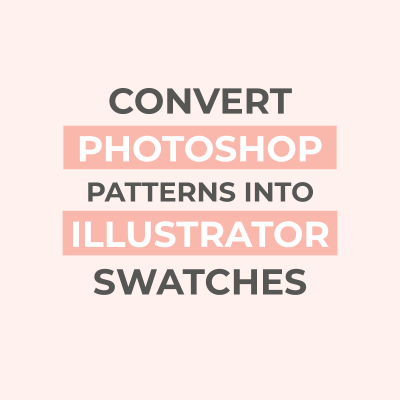 I obviously use it to edit photographs, but I also use it to create website mockups, blog images, moodboards, and even clip-art and patterns. 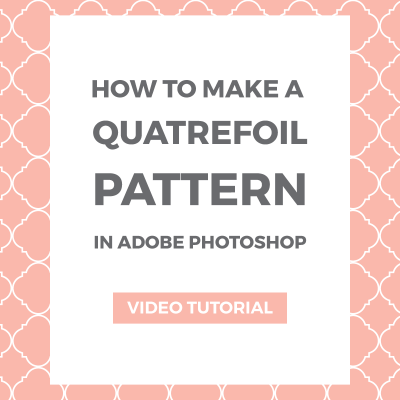 Adobe Photoshop has a lot of tools and it can be quite confusing for a beginner. That’s where the new ‘Learn Photoshop’ series comes in. I’m going to show you how to use some of the basic tools and will eventually teach you how to edit your photos and create better blog images. I’m planning to write one tutorial for beginners every month, and you can find them in the Photoshop 101 category. If you don’t have Photoshop you can download it as a free 30 day trial from Adobe’s website. For those wanting to buy it, there is a great Photography Plan at only $10/month (it also includes Lightroom) or if you are a student you can get the complete Creative Cloud set at a special price. You can also find older versions of Photoshop at good prices. Today’s lesson will show you how to create a new document and we will also take a look around the workspace. When you launch Photoshop, you will notice that there are a lot of tools, but there isn’t any document. You can create one by going to File/New or by pressing Ctrl+N. A box will pop up with a lot of options. Document type and image size: Photoshop has a few predefined documents like paper (letter, tabloid, and international formats like A4), photo, web, and artboards. You can also choose a custom size. Width and Height: For custom sizes, you have to introduce the height and width of the document and you can add it in pixels, inches, centimeters, millimeters, points, and picas. 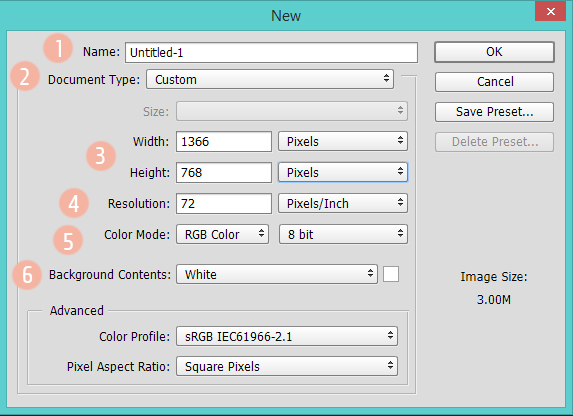 Resolution: refers to the number of pixels per inch that will be printed on paper and the size of those pixels. If you want to make web images you should choose 72 pixels/inch, but if your images are for print, you should choose at least 150 pixels/inch, though it would be better to set it at 300 pixels/inch. Greyscale: it also uses only one channel like bitmap, but it has intensity levels from 0 to 255. You can use it if you want to print your image on a noncolor printer. RGB color: this is what you will use if you want to make images for the web. This color mode is used by computer monitors and the human eye. It’s divided into 3 color channels (red, green, and blue) and each channel has intensity levels that range between 0 and 255. CMYK color: is used for printing and it’s made up of 4 channels: cyan, magenta, yellow, and black. Lab color: it has two channels dedicated to color and one to intensity. Background Contents: you can choose between a white background, a transparent one, or you can choose a different color for it. This is the area you need to get yourself accustomed to. You can add new windows to your workspace from Widow. 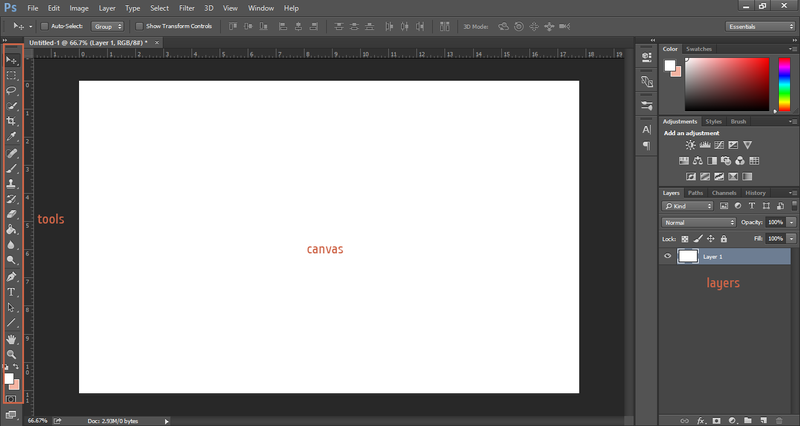 Canvas: is the main workspace where you will create and modify images. History: you can access the History panel from Window. It allows you to see the actions you have taken and you can even go back up to a previous point in your work. Layers: each layer on your canvas is an individual level and work done on a layer is independent of the other layers. Since layers are one of the most difficult concepts to understand, the next lesson will focus on them. Was this tutorial useful? I will show you more features and other ways to use these tools in the future. You’re welcome! I’ll post another one soon. Thank you so much. I love this. I will coming for more advice. You’re welcome! I’m glad to hear that.